You've probably heard that April showers bring May flowers. This free embroidery pattern features an umbrella that has scooped up those blooms and displays them in abundance. I love the smell of rain and the beautiful flowers that come after, and stitching a visual reminder of those two things makes this a perfect design to work on for the remainder of spring and to have around long after. The tiny flowers in the umbrella create a space of very dense and busy embroidery. Leaving the umbrella more open gives your eyes (and stitching fingers!) some rest. However, you may want to consider filling in the umbrella with some applique. Just think of how cute it would be with some red or yellow polka dots! 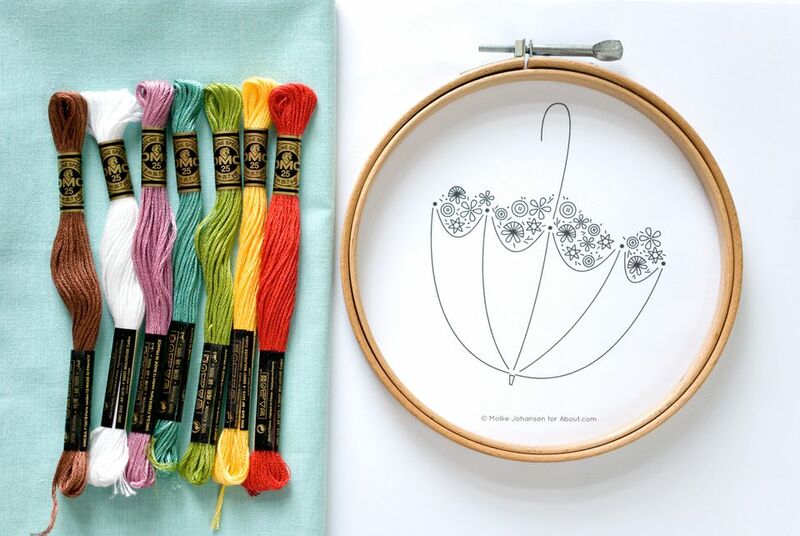 Of course, any bright and beautiful colors can make a great finished embroidery. The floss colors shown above are (from left to right) DMC 632, blanc, 316, 3816, 471, 743 and 349. They're shown with an organic quilting cotton that has a spring rain color to it. This design would look wonderful stitched on a tote bag, kitchen towel or other ready-to-stitch item. Or embroider it on fabric and when you've finished, use your embroidery to make a pillow or wall hanging. Continue on to download the pattern and get a few tips and ideas for how to stitch up this spring floral design! To use the May Flowers embroidery pattern, start by downloading the JPG and printing it on regular paper and transferring it with your favorite method. Or print directly on water-soluble stabilizer for a no-trace method. Embroider the handle of the umbrella with chain stitch or a double row of back stitch. Embroider the outline of the umbrella with stem stitch. Stitch the flowers following the tiny flowers guide and with lazy daisies. Add straight stitch foliage around the flowers. Embroider all solid circles with french knots. For the smaller circles, you may find it easier to create petite knots with colonial knots. If you're feeling especially creative, replace the flowers in the pattern with your own favorite blooms to stitch. You could even simplify by only using one style of flower. Daisies would be great!